Community Blog by FAILCAST // Failcast Episode 1: Confirmed for Brawl! Failcast Episode 1: Confirmed for Brawl! Do not adjust your monitors. After two months of planning and pre-episodes, the Failcast team has finally produced our official first episode for your enjoyment. We've received a few questions about how a podcast that is totally win can be called something as despicable as fail. To explain, let me take you back to December 8th, when cherished community member WiiSucks announced that he was hosting his own podcast. Excited to be featured on a podcast directed by such an admirable blogger, a large group assembled in Dtoid Vent, waiting for 11PM "Western time," as WiiSucks called it. Alas, our 14-year-old host couldn't make it because he "had to do homework" (on a Saturday night, no less). We quickly decided that, seeing as half of us were drunk and looking for something to shout about, to hold our own podcast. Only snippets of the recording were released in an early trailer, but it was obvious why it was called Failcast. Even though we decided to go all serious business on it, we kept the name because...actually, I think we just liked the ring of it. Disregard everything else. Needless to say, we've gone through a lot of different cast members and formats before finally settling on what we give to you today, and what a show it is. Host Yashoki has to put up with Necros, Charlie, and King3vbo leaking their pants after the recent Super Smash Bros. Brawl leaks. Community guest NihonTiger joins the crew and acts like the whore he is. And if we had a "best comment" contest going, Wardrox would surely win it. As always, tell us how much we win or fail, because above all else, this is a community podcast. We just can't do it without you. And by that, I mean you should email us at [email protected] and tell us you want to be on the show. Because once you're on an unofficial podcast cheaply recorded over Skype, you've hit the big time. 20:35 - What is that, Wiisucks? 23:35 - Jim's secret weakness! 44:30 - People care about spoilers in fighting games? 60:50 - Bill Cosby confirmed for Brawl! 78:05 - No more reposts! Click here to download the next hour+ of your life! Or...subscribe to our new RSS feed! We would have an embedded player, but it's still a work in progress (the voices come out like chipmunks for some reason). Also, iTunes is on the way, shut up. 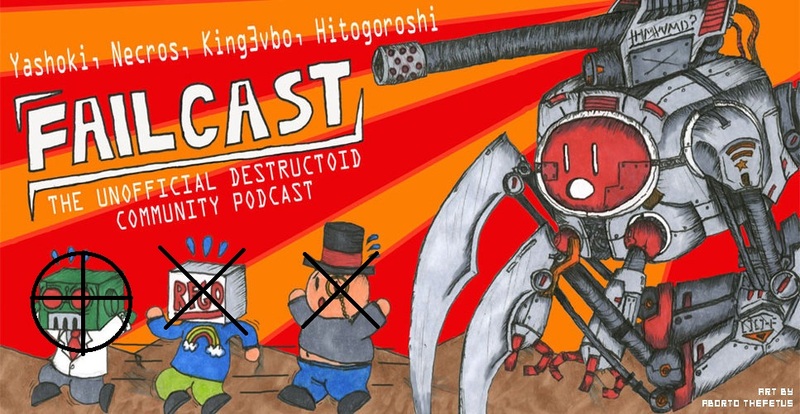 Just a reminder: Failcast is a biweekly podcast centered on the amazing Destructoid community. Next week will feature a short preview episode to introduce our community guest for episode two.